Little Treasure is a superior baby brand that features soft, gentle fabrics made to last and features high-end designs without the designer price. 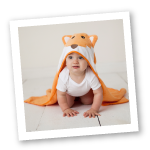 Little Treasure's animal face hooded towel will make bath time so much fun! Made of 100% Super soft, absorbable terry cotton, this towel will keep baby warm and snug after bath. Generously sized at 33x33 inches, this adorable hooded towel will fit your baby for a while! Wear it after bath or just for fun! This towel also makes a great gift for any baby shower! Cherish the Moment with Little Treasure.